Jan 26 2018 - A front-page picture of a worker unloading coal from a supply truck in Anu Majhir Ghat in Chittagong city’s Sadarghat area, published by The Daily Star on Thursday, tells everything that is wrong with our informal labour market. 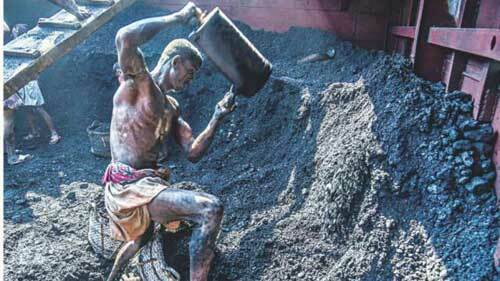 The man in the picture is seen offloading coal with no safety gear on to thwart the effects of exposure to harmful coal dust or prevent bodily harm in the event of an accident. His whole appearance is a throwback to the pre-industrial times. But this is not just a question of safety in hazardous jobs like coal mining or offloading; it’s also about basic human dignity that all people, irrespective of the kind of work they do, are entitled to. The safety and health of the workers are perhaps most neglected in our informal labour market, which is largely unregulated and employs about 87 percent of the entire labour force. The wage labourers and other hired labour are the most vulnerable, as they have to face abuse, insufficient wages, or hazardous working conditions—or all three simultaneously. The way they are reduced to mere beings is preposterous. The image has also captured the underbelly of a country aspiring to get into the club of middle-income-countries, with its appalling safety records in areas involving manual labour. The greed and lack of awareness of the employers also make it difficult to effect changes. The government should pay more attention to improving the work environment and safety standards for the vast community of wage labourers to ensure that they are treated in a manner they deserve as human beings.